Almost anyone looking for a new apartment in Boston this year realized a jump in their rent. The same goes for tenants choosing to stay in their current apartments; most landlords raised their rental rates a significant amount. When taking into account the ever-growing rate of new inhabitants in Boston in comparison to the virtual gridlock of available property to rent around town, this should come as no surprise. According to Rental Beast, a brokerage that follows the rental market in Boston neighborhoods, the vacancy rate of apartments in Boston has dropped from 3.8 percent to 3.1 percent. In Boston's high-end neighborhoods such as the South End and Back Bay, barely 1 percent of apartments are vacant. This past year, anyone renting property in Boston has noticed the exorbitant increase in rent taking place in Boston. Rental prices have skyrocketed, not only for new tenants, but for existing tenants as well. According to Rental Beast, the average monthly rent jumped more than 7 percent to $1,881 in the past year. Currently, the average rental for a two-bedroom apartment in Back Bay is pegged at $2,857 a month, and $1,536 for Jamaica Plain. A New York data firm, Reis Inc. ranked the Boston area as the fifth-most-expensive rental market in the country, after San Francisco and New York. Since there is little to no room to house the continuous boom of individuals in the innovation and education industry, the monstrous increase in rental prices is inevitable. In response to the plight of the rental market, Boston officials have approved construction of 3,256 apartments so far this year. These developments are located in the city's central neighborhoods, where rent pressures are at their most extreme (i.e. Fenway, the Seaport District and the Back Bay). 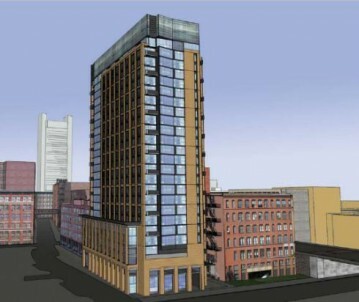 City officials have also approved the construction of 1,077 affordable units throughout the city, specifically for low-income tenants, one being the "micro" apartments under construction in The Boston Wharf Tower, as mentioned in last week's blog about the gentrification of South Boston. These "micro" apartments are part of Mayor Thomas M. Menino's initiative to develop more affordable, "worker" housing-units throughout the city providing middle-income tenants searching for a place to live more options. Hopefully over the next few years Boston sees a decrease in rental prices, if not, it may begin to see a decrease in perhaps the most distinguishing attribute of the city to date, its intellectual creativity.